The Ringside figures from last week appear to show a mart trade for bullocks that had weakened slightly with overall average losses of between 2-4c/kg. The overall picture, however, supports the view that the steer trade was steady and consolidated its recent gains. The general consensus among those managers I spoke to was that, with the exception of the lighter poorer conformation bullock, the trade last week was good to firm. However, does the continuing poor performance of those lighter cattle pose a longer term risk to the overall trade? New Ross auctioneer Jim Bush told me a few weeks ago that a “two-tier” trade was a possibility especially where those lighter Friesians are concerned. Last week’s Ringside average price for the bottom quarter of Friesians in the 300-399kg was just 88c/kg, while last year at this time those animals were averaging €1.34/kg. That is a 46c/kg or €138-184/hd difference. Jim’s prediction gains real credence once you start comparing the averages from this year with last year for the better continental at this weight. 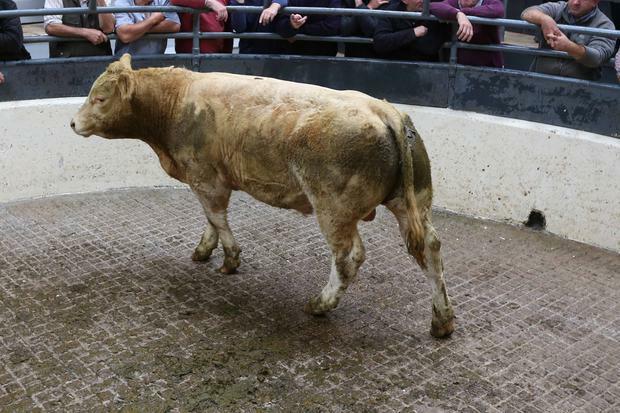 Last year that 300-399kg better continental averaged €2.76/kg – last week he did €2.56/kg. That’s a drop of 20c/kg or from €60-80/hd, but it’s a long way short of the hammering those light Friesians are getting. On the heifer table last week’s figures show those lighter heifers from 350-399kgs got knocked back by 5c/kg. Again, however, the comparison with last year’s prices shows where the real pain is. Last week’s overall average in the 350-399kg section was €1.86/kg, which puts an overall average value of €651-742/hd on them. This time last year you would have being paying €2.19/kg on average or from €766-874/hd. Although last week’s Ringside figures for weanling bulls appear to show a trade moving in the right direction with the 100-299kg bull up a very sizable 46c/kg, that jump has to be measured against a drop of 52c/kg two weeks ago. The watch word in the trade at present appears to be caution, especially where those lighter weanlings suitable for live export to Turkey are concerned. Donald Trump’s trade war with Turkey has weakened the Turkish Lira and although it has clawed back a significant portion of that loss it was still trading at 10-15pc below its previous value last Friday. Many with lighter stock had been banking on the live trade to sustain their incomes this autumn; that hope has now become questionable. That maybe a slight exaggeration as the Ringside figures coupled with conversations I had with mart mangers at the weekend both confirmed that farmer and feedlot buyers remain active for heavier type bulls. This activity boosted 400-600kg bull by 6c/kg to an average of €2.23/kg which translates into a price range of €892-1,338/hd. While the 300-399kg section slipped by 2c/kg on average to €2.03/kg, I would hope that there is enough capacity in the system to absorb any possible fluctuations in supply into the future.